At my house, we love pizza. I mean, we LOVE pizza. And the best pizza is always homemade. That way you have the perfect thickness of crust, the exact amount of sauce, and the perfect combination of toppings. I even have individual deep dish pans and three different sizes of pizza pans. Did I mention that we LOVE pizza? A size for any appetite! Over the years I have tried a LOT of different pizza crust recipes. The sourdough crust is good, but I have found the hands down, go-to pizza crust. And it’s not even a crust recipe. It’s a bread recipe. Shocking. I know, right? Who uses a bread recipe for pizza crust? Well, uuhhmm, I do…and it makes the most amazing pizza crust you’ve ever eaten. It’s a recipe that I got a few years ago from my sister. In the beginning, I made bread with it (like I was supposed to), and then I got a little crazy and I made some bread sticks to go with spaghetti one night. Then I had the brilliant idea (yes I did say brilliant, because that’s what it was; brilliant) to make pizza crust out of it. It was love at first bite. I’ve never looked at another pizza crust the same way again. I have gone so far as to make the pizza crust in the mini pans and freeze it so that we can have pizza whenever we want without having to wait for the dough to rise. I have even, at times, used half the dough for a free form loaf of bread and the other half for pizza crust. All at the same time. What can I say, I live on the edge. Put water and yeast in a large mixing bowl and stir to dissolve. Add all the other ingredients except flour and combine thoroughly. Add 2 cups of flour and mix well. Continue adding flour a cup at a time until dough becomes shaggy and leaves the sides of the bowl. Turn out onto a lightly floured board and knead for 8 minutes until the dough is smooth and not sticky. Clean out mixing bowl and oil with olive oil. Place dough in bowl and turn to grease top. Cover with plastic wrap or a damp towel. Let dough rise in a warm place for 1 hour or until doubled. After dough has risen, punch down and turn out onto a lightly floured board. Cut off a portion of the dough and roll it to fit your pizza pan. You can also make a freeform crust and bake it on a cookie sheet. How much dough you need will depend entirely on how big your pans are and how thick you like your crust. Heat your oven to 450 F. If you are using a pizza stone, put it in the oven before heating and let preheat for at least 20 minutes. While your oven heats, get out your pizza ingredients (or not if you are going to be freezing them :)). 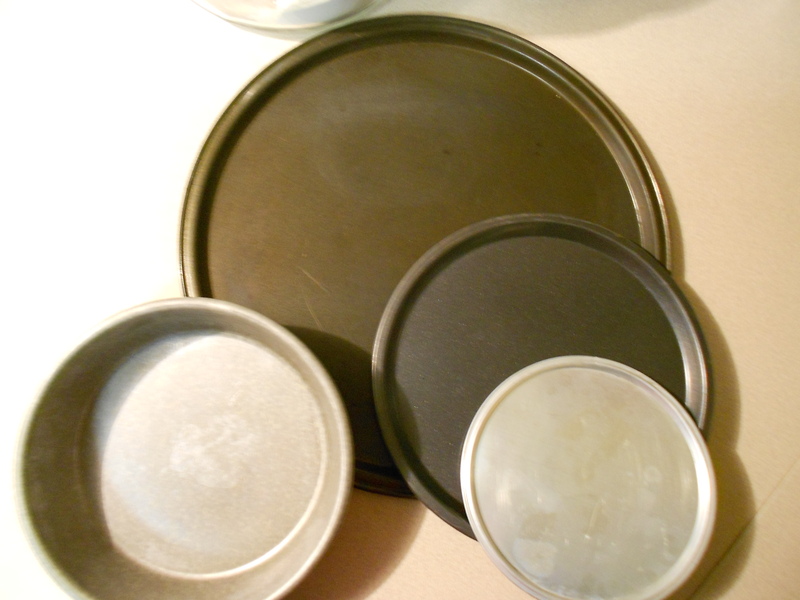 When your oven is heated up, re-roll or re-press the dough to fit the pans. It tends to shrink a little. Use a fork to prick holes all over so that the dough doesn’t puff up. Place in oven. The crusts need to bake for about 15 minutes. I like to take them out after 7ish minutes and remove them from the pans and put them back in directly on the pizza stone. 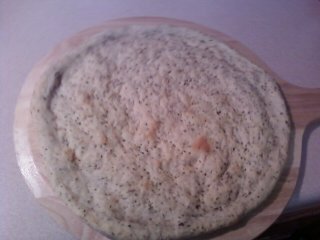 That makes the bottom crust crisper. After 15 minutes remove them from the oven and top with your favorite fixins. Return to oven for about 5 minutes or until the cheese has browned to your liking. Sit back, relax, and receive the praises from your family for making them The. Best. Pizza. Ever! Uuuuummmm, can you smell it? After the first rise, divide dough in half and form into two loaves. This works equally will with loaf pans, round free form loaves, or french style loaves. I have made four thinner baguette style loaves for brushetta or toasted rounds. Let the loaves rise 1/2 hour or until doubled again. Brush with egg wash (1 egg and 1 Tbsp water beaten together) and sprinkle with a little romano cheese. This isn’t necessary, but it gives the loaves a pretty color. Slash the loaves. If using loaf pans, bake at 350 F for 35 minutes. If free form or french style loaves, bake at 450 F for 25 to 30 minutes, until the loaves sound hollow when thumped on the bottom. For an artisan crispy crust, throw a cup of hot water into a heated pan in the bottom of the oven when you put the bread in. This bread is good anyway you want to eat it: still warm from the oven, toasted, cold. I’ve even made croutons out of it for salads. So go whip up a batch and let me know your favorite way to eat it! This entry was posted in Bread, Main Dishes, Mother's Kitchen and tagged baking, bread, homemade, homemade pizza crust, pizza, pizza crust recipes, pizza pans, recipe, recipe for pizza crust by Cery. Bookmark the permalink. Pizza crust, sometimes the un-named hero of an amazing pizzapieeee. Crusty crunch yum yum . so lets give it up for the crust just for once! OK- Ignorant girl question now. I try to avoid using just white flour. I know, I know, this is the best….but ….how much whole wheat flour could I substitute in the recipe and get a good crust (maybe not the best crust ever). Edit-I have actually made this with all whole wheat flour now and it’s just as good.